Custom vinyl graphics, wall art and clothing. 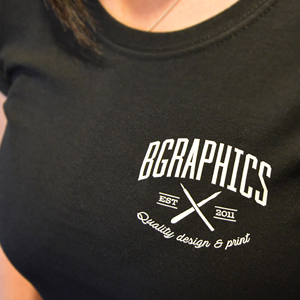 Welcome to BGraphics, your number one source for custom vinyl graphics, wall art and clothing. We’re dedicated to giving you the very best design and print, with a focus on customer service, quality and uniqueness. Established in 2011 by husband and wife James and Kate, BGraphics has come a long way from its part time beginnings in a small loft space at home. When first starting out, their entrepreneurial passion for design and print drove them into intense research, many late nights, and gave them the impetus to turn hard work and inspiration into to a booming online shop. The running of the business is handled full time by Kate after being made redundant from a sales account management position. Kates background in sales helps push the business forward and acquire new opportunities whilst James handles the design and artwork to make BGraphics the success it is today. We now serve customers all over the World and are thrilled to be a part of the the design and print industry.